I’m embarrassed to admit, instead of pushing for the answer, we stayed on the hamster wheel churning out a weekly newsletter featuring one staffer blog post, two curated industry articles, and one marketing meme. No wonder our click-through and open rates were low and never budged. We were focused on fulfilling the obligation to ship the newsletter on time. However, before I beat myself up too much about the quality of our content, I realize now I should have pushed the pause button and taken a step back to investigate. Were the open and click-through-rates low due to lame subject lines and shoddy copy or was our email database full of people who didn’t fit our ideal client profile? We had no idea if we were wasting great content on the wrong people. Today, smart marketers operate like niche media publishers, forgoing a massive but unresponsive email database in favor of a possibly smaller but more engaged audience. If your goal is a more valuable audience, it makes sense to use proven audience measurement methods to better understand the size, composition, and preferences of your audience. To convert the names in your database into an engaged audience, you first must understand who is behind those names. You want to consider demographic, “firmographic,” and behavioral factors because no single factor tells all about a person. Break down your list by demographics (personal characteristics) and firmographics (company characteristics). Many opt-in web forms capture not only name and professional email address but also job title and industry type. From this information, you can determine a lot about the composition of your database. Create parameters for your classifications – gender, job title, company size (revenue and employee numbers), and industry classification, etc. Then code and segment the records by those classifications. Insights available could include the composition of C-level executives vs. non-managerial individual contributors or the composition by department (marketing vs. IT vs. sales). Using this sorting approach, don’t be surprised to find gaps due to inconsistent or insufficient data collection practices. For example, names collected from scans at trade shows over the years may vary in their depth of information because of the evolving technological capabilities. You can explore third-party “data-appending” services, which would offer additional details about your database. While a single project can be expensive, most providers offer discounts for annual subscriptions to their service. Alternatively, you could search for additional details on LinkedIn or in other online searches and manually update your database. Whether it’s your team’s time or a contract with a service, the investment to learn more about your database contacts is worth it. While segmenting by demographics and firmographics is an important first step, it doesn’t provide the depth of insight to help you program your content to engage your audience. You haven’t yet shed light on the desires and motivations of your audience. Lean into behavioral segmentation and your lead-scoring system. If you have a marketing automation system, you can track the web activity of people in your database and assign lead scores based on their actions. That provides critical insight into the kind of information people in your audience respond to. Marketing automation software is great at tracking the people in your database who actively engage with you. But in many cases, lack of engagement is the problem you’re trying to solve. If you focus only on the behavior of your engaged database members, you risk missing the big picture. And another caveat: Analyzing your own database limits your insight to the characteristics and behaviors of the people who have connected with your company. How do you know whether these people reflect the broader desired audience? Is your list skewed or biased in any direction? You need to do more work to get the answers. You can start with demographics, firmographics, and behavior data, but the key is to find out how the characteristics of your database compare to the characteristics of the market you’re going after. To better understand your database in relation to the overall market, you can apply audience evaluation methods used by the media industry. Having this insight will help benchmark your current database (composition and value), understand the gaps in your audience, and build an investment case to grow an audience that will deliver for your organization. To get started, borrow a page from media measurement powerhouse Nielsen. It analyzes its audience-measurement sample composition in local markets by producing “in-tab” reports that compare sample groups to “universe estimates” for the market. These reports are great at identifying the gaps of market penetration or over/under audience representation. Decide on a target audience aligned to your ideal client profile. Your audience is most likely composed of your best current and future buyers. In some cases, your target could be customers you don’t have but aspire to reach. Once you’ve decided who you want as your ideal audience, you can then develop a universe estimate, more commonly known as the total addressable market. Market sizing helps you determine the level of effort and resources required to build an audience comprising your ideal clients (more about this in Step 3). The goal is to determine the total size of the target audience, which is used as the denominator for market share calculations. Consider whether you want a single-digit share of a massive market or deep penetration of a niche market. Example: Being early in its maturity, Acme’s B2B marketing team decides to target all B2B medical marketers rather than a subset of medical marketers. With a firm handle on the identity of your total potential audience, develop a set of characteristics to understand the composition of the audience in your target market. Remember, personas mask the opportunity for true precision in your audience understanding. Which characteristics – demographic or firmographic – may be important to know about your target audience? You’re looking to create discrete segments to truly understand the depth and dimension of your audience. Then you can create a blended sketch or composite view of the target audience – the asset you seek. Example: The Acme marketing team recognizes that “B2B medical marketers” isn’t descriptive enough for its target audience. It chooses to segment based on gender, seniority, and company size because these are the most observable and reliable characteristics at this point. For this stage, you should use reliable industry resources to develop the most accurate market size and audience composition counts possible. For example, this report from Salesforce Research and LinkedIn provides valuable benchmarking data to inform the total audience profile for a half-dozen sectors. LinkedIn can be a great resource for estimating the size of your target audience. Industry associations also usually have solid estimates on the total count and characteristics of their industry. At this point, enumerating your niche market will be more art than science for beginners. In the B2B space, available data isn’t as vast as it is in the B2C space. While you won’t have every characteristic populated, making some reasonable assumptions on the count of the people in a market segment is a great way to build reality checks to understanding sizing the audience opportunity and composition. Example: The table illustrates Acme’s target audience of B2B medical marketers in comparison to the overall audience of medical marketers based on data from the Salesforce Research report. With the industry data and calculations, you now can identify how your database audience reflects the overall audience, including opportunities to focus on and invest in audience development. Reflects proportionately to the available audience for companies between 501 and 1,000 employees, but captures a higher percentage of companies with 1,001 to 10,001-plus employees (65% vs. 55%). This analysis now can inform Acme’s content marketing strategy, from content creation (i.e., create content better targeted to attract a senior-level audience) to content promotion (i.e., develop outreach plan to capture more of medical marketers in the United States). Acme has a lot of work to do. It’s barely reaching its market potential, and its gender composition and seniority levels are skewed. The only bright spot is the company size target reflects Acme’s focus on mid-market and small enterprise organizations. Acme is reaching the right type of company, yet it is most likely not reaching enough of the right type of people. We’re really just getting started by understanding the relative size and composition of who is in your audience and who isn’t. Use this method as a tool to help your management understand the current state of your audience or email database and how much work you have to do to develop the strategy and content to improve your composition by engaging your ideal clients. For example, the Acme team could justify new content initiatives that address director-level information needs by showing decision-makers how underrepresented that segment is in its current contact database. Once you understand the gaps in your database as it relates to the market as a whole, you can decide how to invest the resources to improve your audience composition. If you want to take the analysis to the next level, you can derive the total asset value of the audience you currently have or­ – more importantly – the audience you want. To understand how to do that, read Robert Rose’s recent article The Audience Valuation Engine: A New Model for Calculating the Value Per Subscriber. It’s time you stop beating yourself up about your open rates and engagement rates and consider that you just might be throwing great content at the wrong people. Hear from Robert Rose and how content strategy can help your customer understanding, and much more, at the Intelligent Content Conference March 20-22 in Las Vegas. Register today. Jeff Leo Herrmann is a B2B showrunner and the president of Madison, Michigan, and Market. 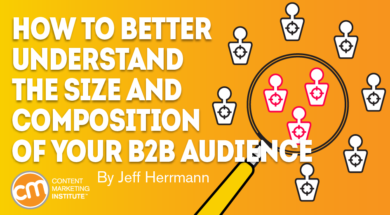 Jeff loves helping CMOs align their content marketing strategy to a winning sales process. In addition to being a mobile marketing pioneer, Jeff has an intense belief that organizations are better off engaging their audiences with educational and entertaining content rather than blasting them with traditional interruption-based advertising and sales campaigns. Jeff earned an MBA in finance and economics from the University of Chicago Booth School of Business and holds an undergraduate degree from The Ohio State University College of Arts and Sciences. Follow him on Twitter @JeffLHerrmann and LinkedIn.